The flower garden planting continues. This very small, square garden is next to my driveway. This is a cheater garden. When we cut down an overgrown shrub from this spot (many years ago), instead of paying the cost of having the stump removed (because money was tight), I made this spot into a flower bed. We cut the stump as low as possible, and then covered it with dirt! Instead of putting all the plants in the ground, I opted to plant some larger plants or mixes in galvanized buckets. 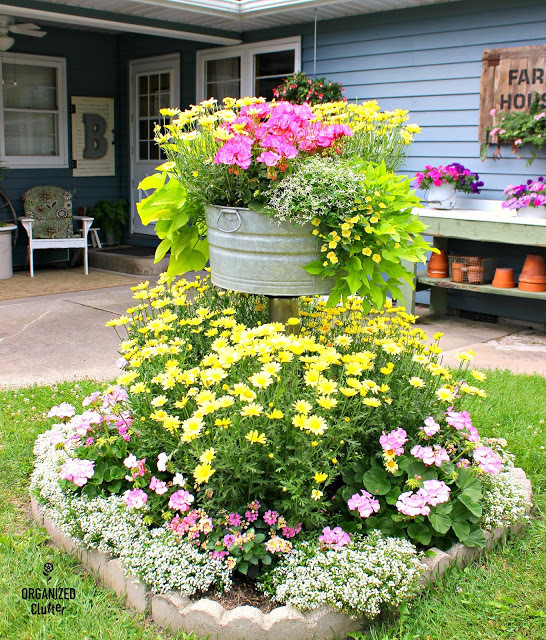 Varying plant heights using containers, pedestals, etc adds vertical interest. At the left is a Blushing Princess Alyssum. It's a newer, and improved version of the 6 pack style Sweet Alyssum. 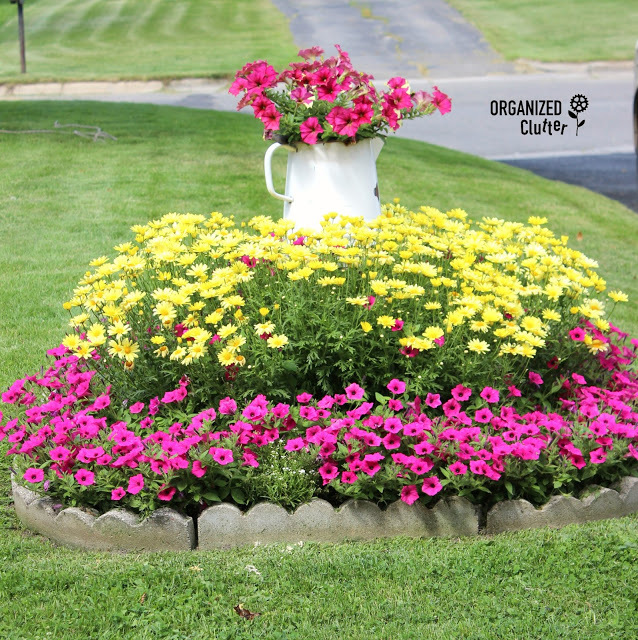 It's bigger, and requires no deadheading or "summer haircut" like the original Alyssum six packs. 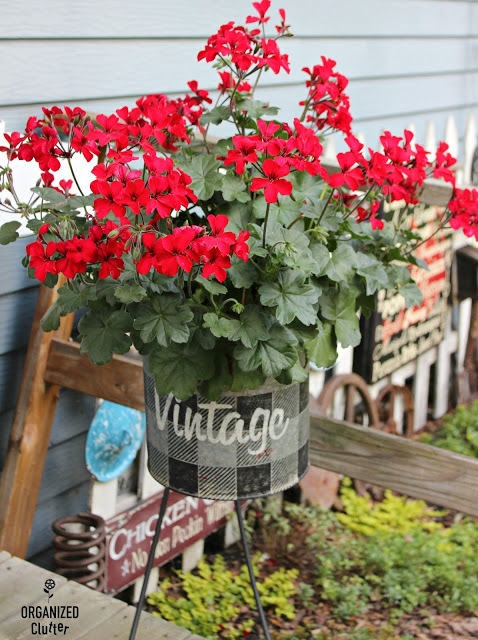 Next, in a bucket is a cheap red ivy geranium that I purchased at our local Menards in a plastic hanging basket. With premium plants in 4" pots priced at $4-$5 a plant, purchasing sale or promotional baskets or combos is sometimes a good buy. Right now they are not in full bloom but ivy geraniums produce a profusion of blooms. 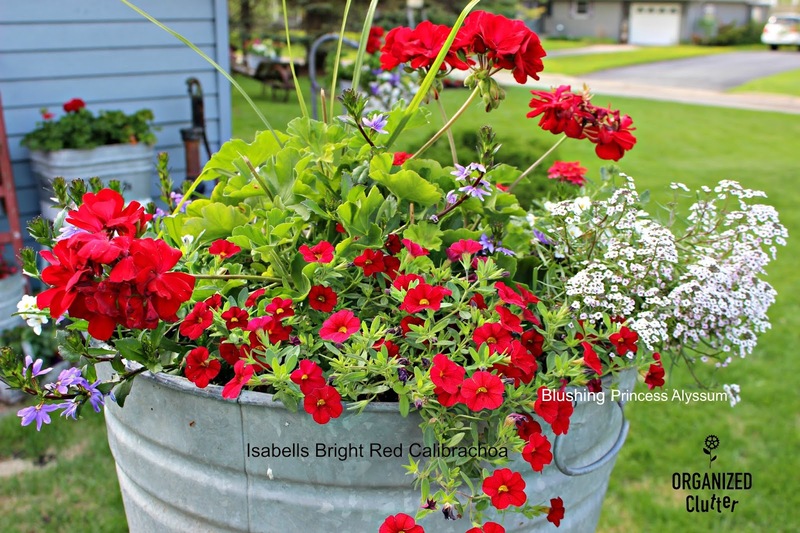 Last year I planted a Menard's ivy geranium basket in my buffalo check minnow bucket. My garden also has two Crazytunias. I think they are a new hybrid for 2018, Crazytunia Constellation Gemini. I purchased several mixed hanging baskets at Kmart too. They were planted with Calliope large dark red zonal geraniums, Bombay dark blue Scaevola, Dracaena spikes, and Calypso jumbo white Bacopa. I re-potted the baskets into stenciled buckets here. I added one of the Kmart baskets to my laundry tub on a table pedestal from last year. 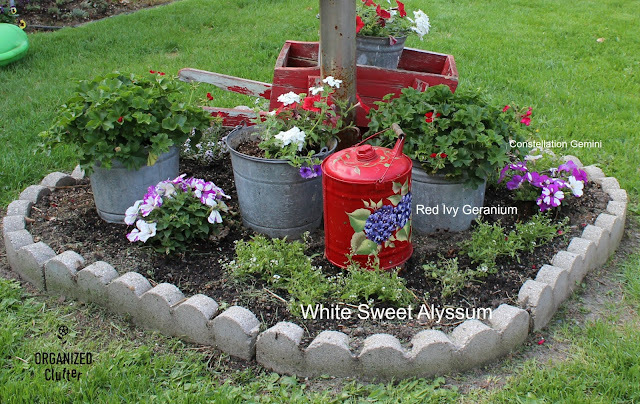 I added a Burpee Isabells Bright Red Calibrachoa and a Blushing Princess Alyssum as well to fill out the tub planting. 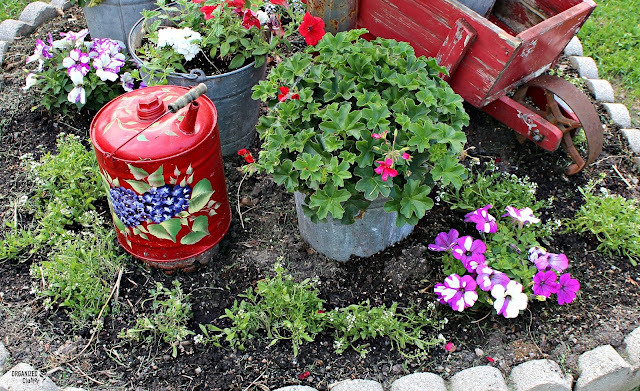 I love the red gas can I purchased at the thrift shop with hand painted hydrangeas! 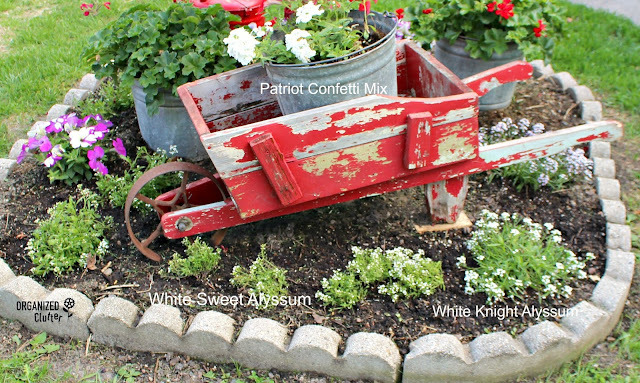 The Patriot Confetti Mix combos were also from Kmart, and featured a red Petunia, a white Verbena and a purple Calibrachoa. 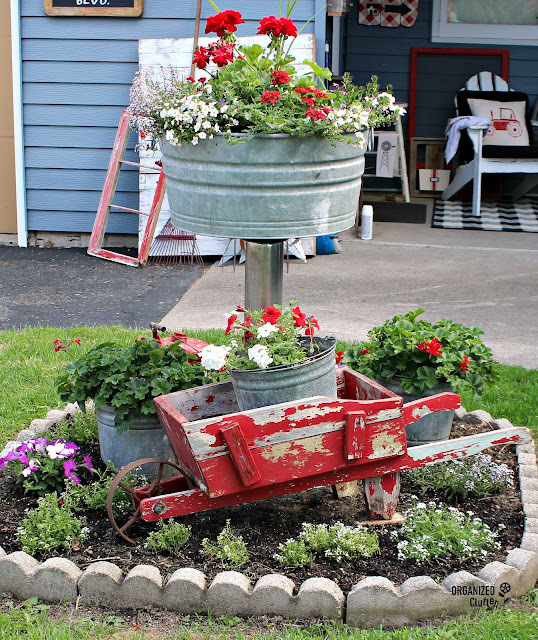 I think this little red chippy wheelbarrow works perfectly in this small garden. I found this wheelbarrow last fall. What a great job, girl!!!!! I've followed you for years and I almost always come away inspired and filled with creative ideas!!!! 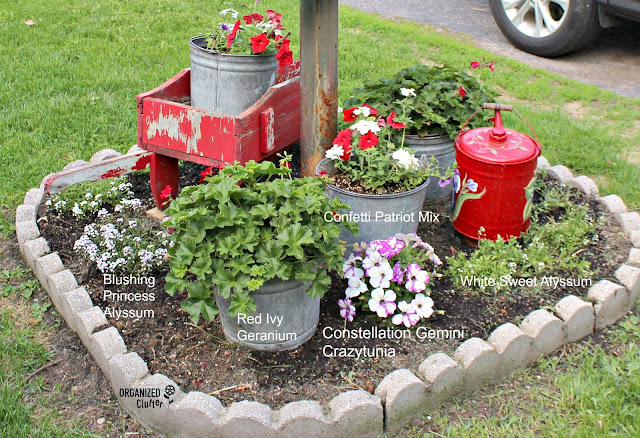 LOVE how you have elevated simple items (wash tub, coffee pot) and filled them with flowers to give your gardens "height"! REALLY enjoy your posts!!! Have a great summer! Way to style your garden Carlene! So much sweet character and color. Love it! I love your garden, it is amazing to see how many looks that front area has had over the years. Thanks for sharing and inspiring me! 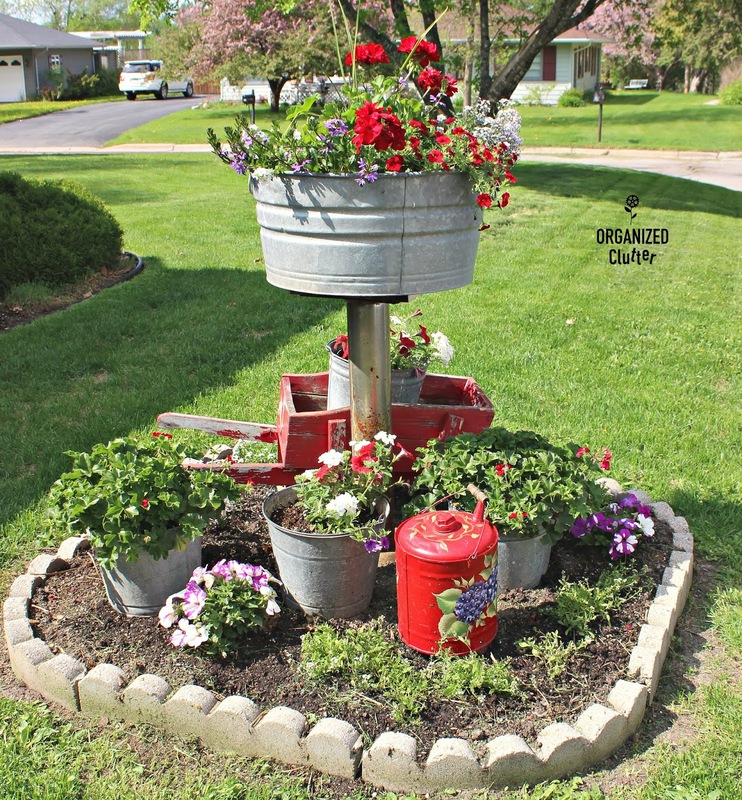 I wish I had more gardening time - everything looks so beautiful in all your gardens!